Fun festive take on the traditional Keep Calm slogans. 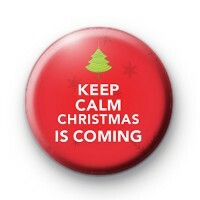 This Xmas red badge has the text Keep Calm Christmas Is Coming Badge & a green Christmas tree at the top. If you know someone that gets a little stressed out over the Christmas period then this could be a fun badge to gift them this year. If you're looking for other Christmas designs we have over 600 to pick from including classic Santa badges, Snowmen and even snowy Penguins. We also have a huge selection of Festive slogans.